Time for a quick update on the Incorporated Village real estate market: what's sold; what's new and what is still for sale. 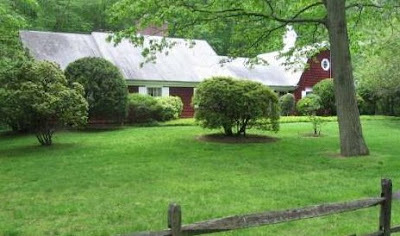 First up both of these houses are Under Contract, as is this lovely Dutch Farm Ranch opposite the Police Station. It's billed as another handyman special, and the price reflected that but I think it's an attractive style and it's on a lovely piece of property. Still for sale are the gatehouse to the original estate, the two houses that actually increased their prices, the Craftsman on the hill and everything between here and the shoreline. Either that reflects the higher price points of these homes and consequent limited buyer pool or the difficulty getting insurance for a house within 1000' of the water. Newly on the market is this Hampton style shingle house. Built on the footprint of a ranch on a corner lot, $2.5 million seems a lot of money for a one-car garage but the landscaping is pretty and I like the kitchen, which is done in cream rather than ubiquitous white. Hampton Style seems to be gaining popularity here on the North Shore, this is the second one to be built this year. 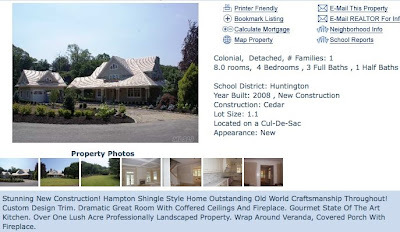 Of course if you google Hampton Shingle Style you get its greatest proponent: this guy.